“Miller/Watson Architects has done an outstanding job of leading this effort through a solutions oriented approach in dealing with every obstacle and always with a positive win-win attitude." - Robert A. Butler, VP of Operations, Elford Inc. The project involves upgrading the interior finishes of the inpatient suites of the tenth floor of Doan Hall, ninth floor west of Rhodes Hall, and the eleventh floor east of Doan Hall. The nurses’ stations on those floors were also completely renovated. 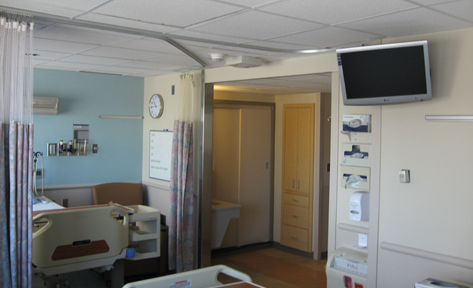 Scope consisted of minor finish upgrades to patient rooms, common areas and dialysis area. Work included: patch and paint, replacement of ceiling pads and painting of ceiling grid, flooring replacement, new shower bases and doors, new toilets, new lavatories, new storage, light fixture replacement and new casework. Additionally, a new ADA and two Bariatric suites were added.